Nothing sends chills through the spine of a student in driver’s education like parallel parking. Thanks in part to Hollywood, this form of parking has become notorious for being difficult. But what if it isn’t as difficult as you might think? With some patience and practice, parallel parking can be mastered by remembering these five simple steps to doing it right. The first step to parallel parking can really impact how difficult the parking job will be, so pick carefully. Choose a spot to park your car that has enough space to fit your vehicle. While this might sound like an obvious consideration, many people struggle with parallel parking because they pick a space that is too small. As you pull up to a spot, notice how much room you will have in front and behind your car once parked. There needs to be a comfortable amount for you to back into the spot and straighten out, but also enough room for the cars around you to pull out easily. If you aren’t sure the spot is big enough, it is usually better to just pass and go find a different parking space. Parallel parking isn’t done by pulling in with the front of your car first. You must pass the spot and back into it to do it successfully. Let the drivers around you know that you intend to park there by turning on your blinker. Pull up next to the car you will be parking behind and line up your back bumper with their back bumper. This puts you in the prime position for parallel parking. Slowly begin to back up into the spot, aiming toward the back-right corner of the parking spot with your bumper. Turn and watch over your shoulder, but also utilize your rear-view mirrors to get a clear picture of your surroundings. Once you are lined up with the bumper of the car in front of you, you are in the spot and ready for step four. Once you are in the spot, straighten out the tires by centering the wheel. This will help you finish pulling all the way in without hitting the cars around you. Do your best to center your vehicle between the front and rear cars. Again, you want to make sure that both drivers will have enough space to pull out without hitting your vehicle. Once you are centered, you can put the car in park. 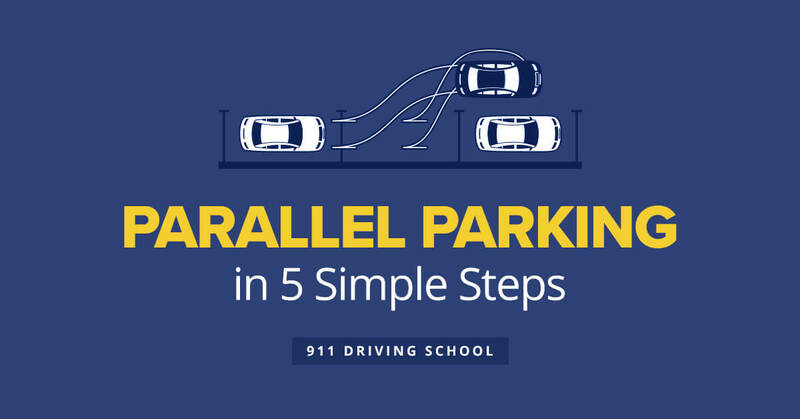 After completing these five steps, you have successfully parallel parked your vehicle. You may safely exit your car and go about your business. This may all seem like a lot to remember at first, but after a few practice parking jobs, you will start to feel more comfortable doing it. When just starting out, it might be best to do some practice parking between two orange cones that give you a generous amount of space between them. Move them closer together as you get better at parking between them. This will help build your confidence and help you stay calm during your driving test.